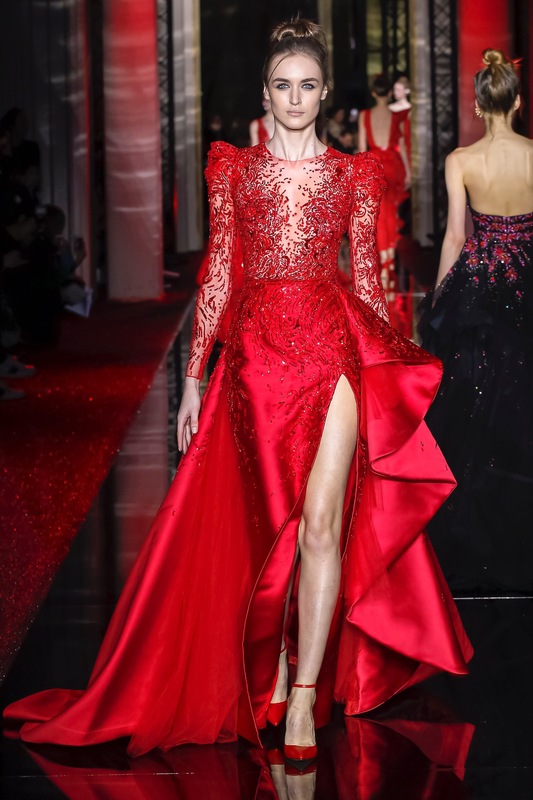 Zuhair Murad celebrates beauty, opulence and fashion in his Haute Couture Spring Summer 2017 collection. Inspired by the fireworks he has recently witnessed on the Japanese island Miyajima, Murad lights his show with “pyrotechnic” dresses glimmering in Swarovski Crystals. Also inspired by the eighties — the cuts, volume, shoulders — Murad transforms his runway – using disco music and colored changing lights – into a nightclub! With their spectacular volumes and glittery elegance, these 20 dresses are also a fun reference to the eighties TV series Dynasty. Organic draping resembles the isle’s waves and the gowns’ colors are as intense as fireworks’ ones; And just like fireworks are reflected on the shadowy waters, gowns are virtually replicated on a mirror-like ground. Welcoming the audience into this theatrical extravaganza are two models, whose ruffled tulle ingeniously frame their faces, and whose belts sensually highlight their waists. This mermaid dress looks like a night on fire, lighting the black sky with its red fireworks. The heart shaped, draped corset adds to the “electricity” of the design. Murad’s ladies in red fire up the audience with their magnificent beaded crystals. The enveloppe dress is very modern with its plunging neckline and graphical motifs, while the second exudes exuberance with its beaded motif, high slit and long folded trail. Murad awes his audience with all types of fireworks! 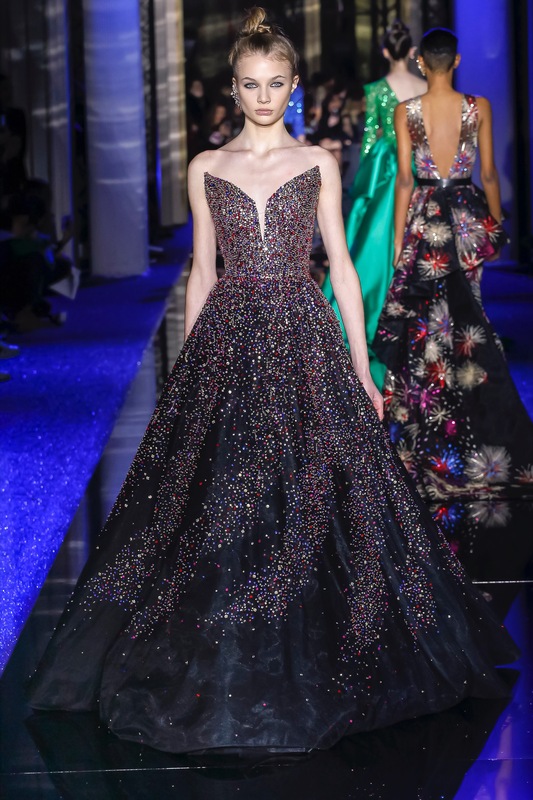 Trails of lighted dots swirl down on the first long dress, while embroidered crystals reproduce a typical fireworks’ rendition on the second short one. Grandiose parties call for grandiose bows! Nothing is common about these dresses: from the bows’ size and the cuts’ extravagance to the vivid fuchsia and the intense, red and pink, mix. Ball gown in fuchsia with a plunging neckline. The mix between the diagonal sharp beaded lines on the shoulder and the soft drapés makes it quite an original design. With its angular lines and glamorous folds, the short dresse is a little glamorous gem. Both designs are flirtatiously skin baring. Despite being grandiose, this dress does not come short of sensual curves! The beaded lines and the folds are beautifully arched, adding a lively twist to the princess dress. 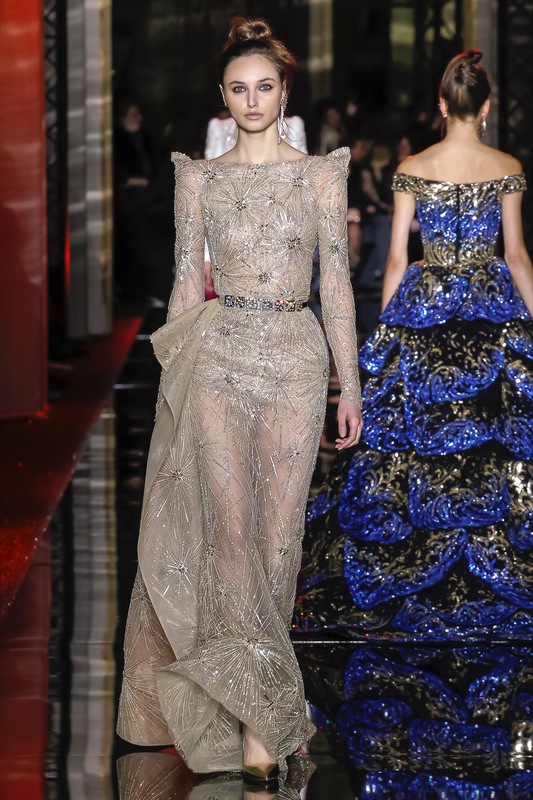 Theatricality is once again celebrated in these dresses. The first one is distinguished with its internal color (which we love! ); while the second with again, the ruffles’ frame we mentioned in the beginning. Just like the night reunites sea and sky, Murad mixes tight skin baring guipure and intricately folded satin duchesse. This is one of the most sophisticated designs of the collection, gracefully symbolizing the entire themes and inspirations. Not only will you experience Miyajima’s fireworks through the blue embroideries and black sky dress, but you will also go back to the eighties with the dotted tights, folded micro skirt and opulent trail. 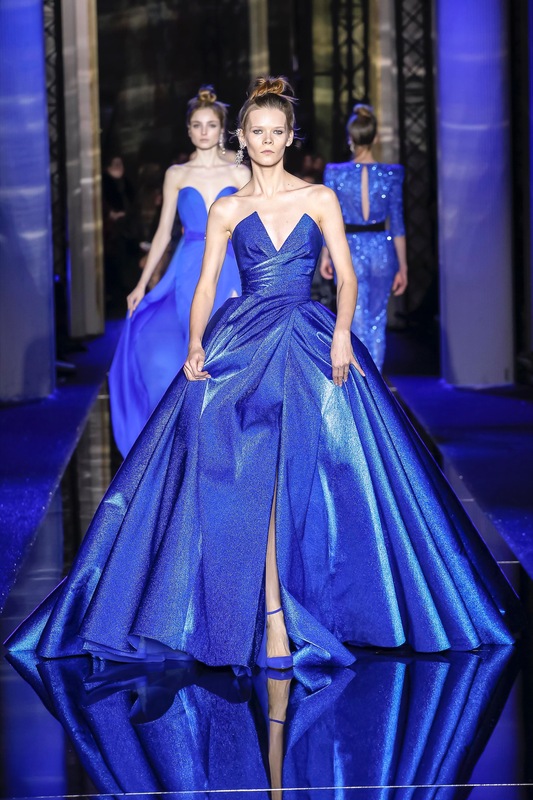 This blue silk masterpiece can turn our dancing party into a majestic ball. Its shining effect is simply dazzling. After the show, everybody rushed to congratulate the designer and ask him about his inspiration by Dynasty, the eighties and the spectacular Japanese fireworks that sublimated these themes. Everybody knew that this collection would be perfect for the Red Carpet season!